It seems like veils are becoming more and more popular these days. Therefore we are thrilled to announce the arrival of our newest veil designer, Hermione De Paula. Each embroidered veil can be entirely personalised for you. The Hermione De Paula veils can feature anything from your wedding date to a song lyric or quote, all beautifully embroidered in the most intricate floral designs. 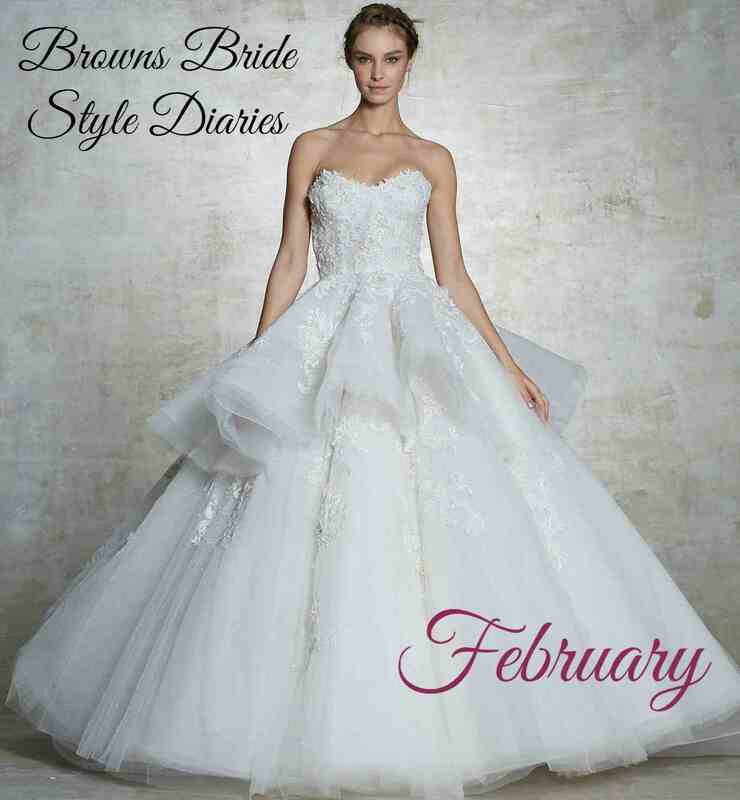 The Daisy gown is our newest gown from Peter Langner. 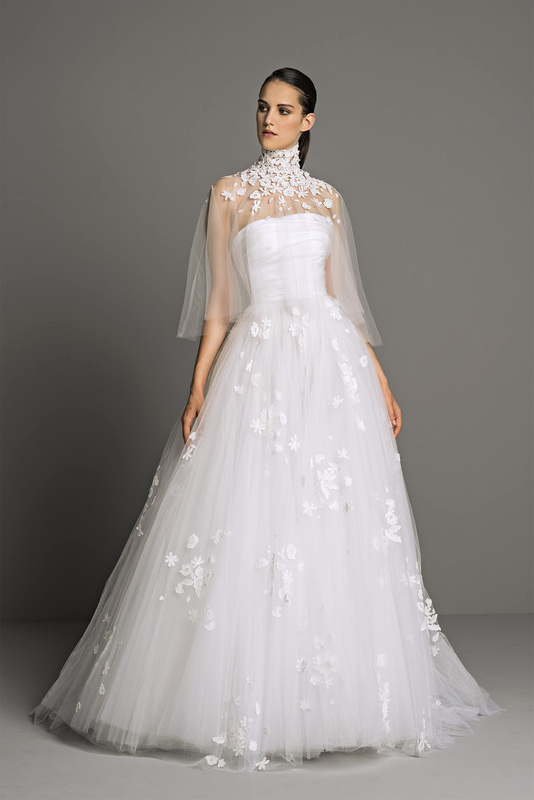 The guipure lace has been appliqued throughout the billowing tulle skirt. The Daisy gown also has a little lace capelet to match which makes a perfect cover up during the ceremony or the perfect accessory for a winter wedding. This mermaid gown from Galia Lahav is adorned in cherry blossom petals. The shimmering layer of “Twilight” tulle runs underneath the lace adding a very glamorous element to this overall romantic gown. The detachable off the shoulder sleeves help transform this dress from day to night, and yes – you can have the front part filled in! Make an entrance with this stunning ball gown with long lace sleeves. 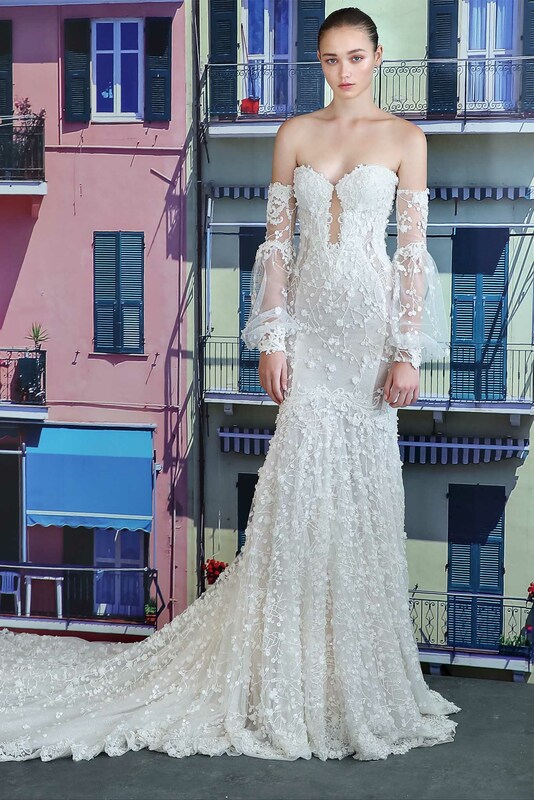 The Aurelia gown is certainly a modern twist on a traditional lace ball gown. Despite its classic elements such as the delicate sleeves and full lace skirt – the Aurelia has contemporary details hidden throughout. 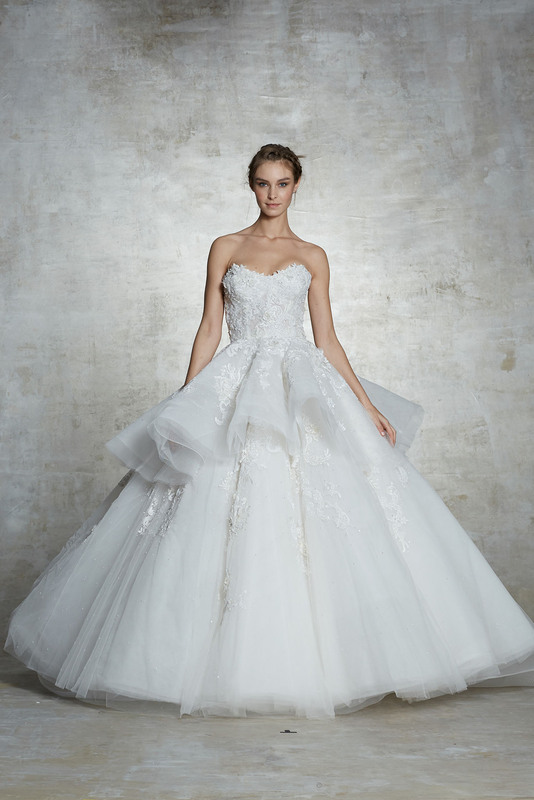 This dramatic ball gown is sure to turn every head. The short lace corset helps accentuate the waist whilst the full skirt packs a punch with the drama. The gown features embroidery and embellishments and most noteworthy is it’s extraordinary 6 foot train!